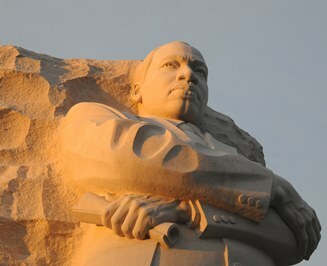 The recently dedicated Martin Luther King Memorial in Washington, DC. More than 300 volunteers from area businesses and organizations honored the memory of Dr. Martin Luther King Jr. by dedicating a day of service at Martin Luther King Jr. Middle School on Monday. “Dr. King’s legacy is actually a lifestyle, a way of life. The main motto we’re emphasizing is everybody can be great because everybody can serve,” said Kimihira Miyake, a spokesperson for the Global Peace Foundation, which helped organize the service projects. Martin Luther King, Jr. Middle School is the host school of GPF’s Leadership Academy pilot program in Atlanta, and many of the middle school's students participated in painting the school and landscaping the grounds, as well as preparing care packages for veterans. The day of service emphasizes "the importance of giving back to the community, the importance of supporting one another, and just understanding we all have to work together for the good of all," said parent Pamela Matthews in a report on Martin Luther King Middle School by CBS News. The federal holiday in honor of the slain civil rights leader was signed into law on November 2, 1983 by President Ronald Reagan. Legislation to designate the day as Martin Luther King Day of Service was coauthored by Pennsylvania U.S. Senator Harris Wofford and Atlanta Congressman John Lewis and signed into law by President Bill Clinton on August 23, 1994. The legislation challenges Americans to observe the holiday through volunteer service. It is observed on the third Monday of January each year, in recognition of King's birthday on January 15.